It's sort of wild to think that at this time last year we had only reviewed a handful of Ultrabooks. So few, in fact, that we could count them on one hand: Acer, ASUS, Lenovo and Toshiba. HP made five, with the Folio 13, an ultraportable that was aimed at the business market, but that ended up being our top all-around pick thanks to its stellar battery life, comfortable keyboard and wide port selection. Since then, of course, HP's gone a little overboard with the ultraportables, with glass ones, metal ones, expensive ones, budget ones. Ultrabooks that aren't actually Ultrabooks! It's a vast, sometimes confusing selection. 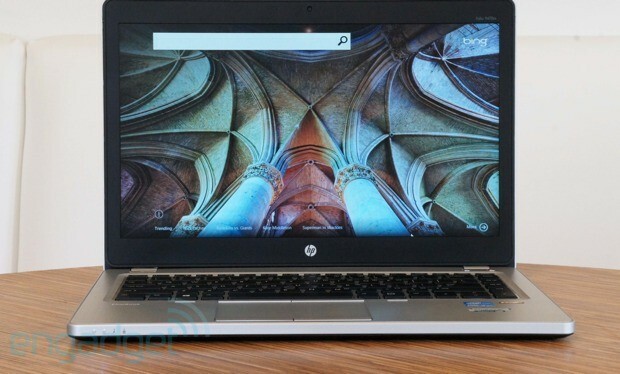 Now, though, almost a year after we reviewed the Folio 13, HP is back where it started with another business offering. The EliteBook Folio ($1,049 and up) has a 14-inch screen this time, and is the first Ultrabook in HP's high-end EliteBook line, typically aimed at corporations and other businesses with IT departments. We know, we know: "pre-boot authentication" aren't exactly the sexiest words in the English language, and indeed, we usually just review laptops aimed at consumers. The thing is, though, the EliteBook Folio isn't your typical corporate box: with a magnesium frame and soft-touch finish, it's attractive enough that it could pass for your personal laptop. So does it perform well enough to use as a work-play machine? Read on to find out. 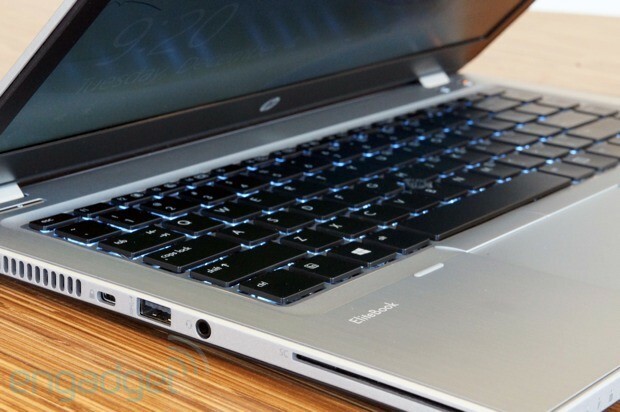 Though it's aimed at businesses specifically, the EliteBook Folio is among our favorite Ultrabooks thanks to its long battery life, comfortable keyboard, smooth trackpad and fast performance. 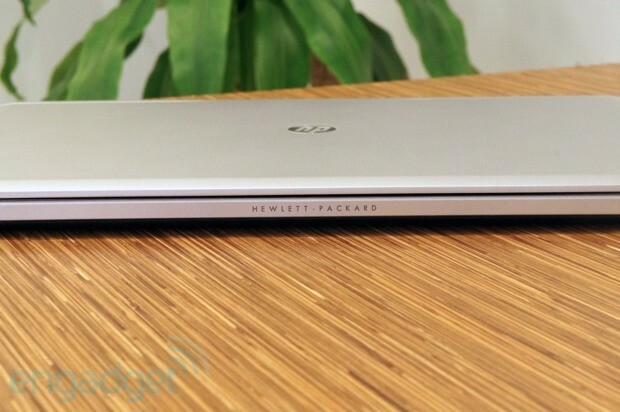 How would you rate the EliteBook Folio 9470m? If you look closely enough, you can tell this is a business machine -- that tracking stick, for one, is sort of a dead giveaway. Even so, it's more stylish than we would have expected a corporate system to be. Whereas HP's previous EliteBooks were clad in serious-looking brushed metal, the Folio has a more playful feel, with a soft-touch finish coating both the lid and bottom side. And though the keyboard deck is still made of brushed aluminum, the effect is much more subtle this time out. All told, it feels a little less buttoned-up than other business notebooks, a little more consumer-friendly. At the same time (and this should go without saying) it's still conservative enough that you can safely whip it out during your next business meeting. Then again, unless you own a gaming rig with a fire-breathing dragon spray-painted on it, any laptop would be appropriate, no? If you look closely enough, you can tell this is a business machine -- that tracking stick, for one, is sort of a dead giveaway. 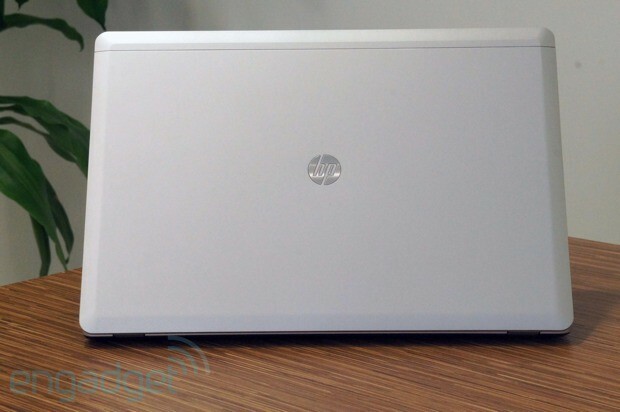 The fact that this meets Intel's Ultrabook specifications should tell you this is a fairly thin, lightweight machine. Still, at 3.6 pounds it's quite a bit heavier than the Lenovo ThinkPad X1 Carbon, which tips in at three pounds, flat. It's also thicker, at 0.74 inch, but that makes sense: it has an Ethernet jack and the Carbon doesn't. That said, it's still easy to carry around, especially if you're used to schlepping something in the five-pound range. Continuing our tour, other ports include three USB 3.0 connections, a VGA socket, a DisplayPort, a headphone jack, Kensington lock slot, an SD slot and a SmartCard reader. The only compromise here seems to be the lack of an HDMI port, though perhaps that's of less importance to business users than VGA output or a DisplayPort. Returning to the keyboard deck, there's a fingerprint reader tucked on the right side of the palm rest; above the keys is the power button, along with dedicated buttons for muting the sound and turning off WiFi. That power button, by the way, is very narrow, and slightly recessed, which makes it tricky to press with the pad of your finger; you might need to dig a nail in there, which is unfortunate considering how often you'll be turning on the machine. Over on the left side you'll find a slim, little vent, which pushes out cool-to-warm air, depending on how much you're taxing the PC. Thanks to HP's built-in CoolSense technology you should be able to work comfortably with the laptop in your lap, though the fans can get a little noisy at times. Not as loud as some other Ultrabooks we've tested recently, but you might notice a gentle whirring coming from the side of the machine, even if you're just browsing in IE 10. Under the hood, you've got TPM, which should make IT managers happy, along with a hard drive accelerometer to help protect the disk in the event of a drop. Lots of business-friendly features on the software side, too, but we'll get to those in due time. Somehow, it seems like there's less of an excuse for a bad keyboard on a machine meant for business users -- really, there's no excuse for anything that makes it harder to get work done. Fortunately, the Folio delivers with a cushy keyboard -- cushier than you'd expect, perhaps, given that this is such a thin machine. While lots of other Ultrabooks make do with flat, lifeless keys, the Folio offers a surprising amount of travel, so that you can type at a fast clip and not have to worry about whether your various key presses are registering. The buttons are well-spaced, too, and yet HP apparently didn't have to shrink any of the major keys, like Enter or Backspace. The main compromise seems to be around the arrow keys: while the left and right ones get plenty of space, the up and down ones are tiny and stacked right on top of each other, making it all too easy to hit the wrong one. That won't be a problem for some people, but if, like us, you have a tendency to highlight text using the keyboard, you'll need to watch where your finger lands. As you'd expect on a premium system, the Folio is also backlit, which you can turn on and off using the F11 key. 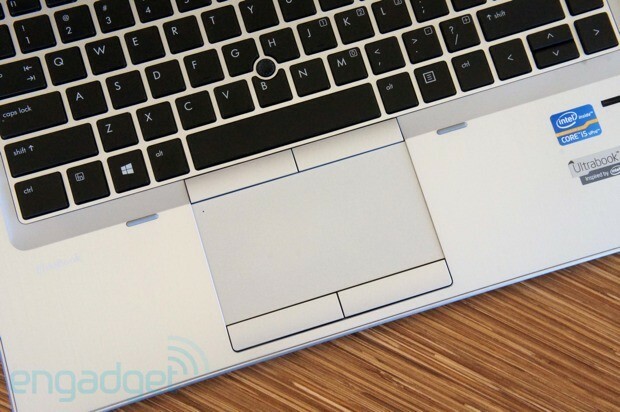 Happily, the trackpad is about as good as the keyboard -- something we wish we could say about every laptop we tested. As it happens, it's a touchpad with good old-fashioned left and right buttons, as opposed to one of those new-fangled ones where the whole surface is one giant, clickable button. Somehow, this doesn't strike us as a coincidence: traditional touch buttons seem to have gone out of style but when we do see them, they almost always seem to work perfectly. Or at least, much more smoothly than clickpads, which have the nasty habit of mistaking left clicks for right ones. Here, the surface feels smooth and glassy, and responds well to various multi-touch gestures, not to mention single-finger navigation. The buttons are easy to press too. 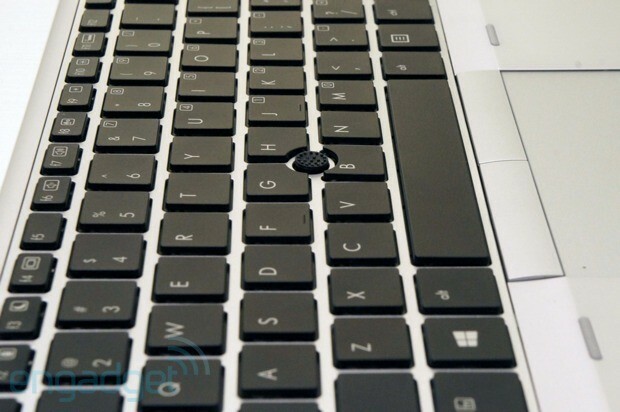 In case that touchpad isn't doing anything for you, though, there's also a pointing stick wedged between the G and H keys, complete with two secondary touch buttons sitting just below the space bar. Compared to the version on new ThinkPad machines, this one is taller and slightly flimsier (then again, Lenovo sets the bar pretty high). Still, the scooped-out shape and bumpy texture make it highly unlikely your finger's going to slip off. Also, the tracking feels precise, which is obviously a plus. The Folio has a bright, matte display, which should please lots of business users, though it also serves as a reminder that a matte finish doesn't necessarily equate to good viewing angles. If you've got the notebook in your lap and dip the screen forward, you'll immediately notice some washout. Still, watching from the side is a little easier, and if that doesn't come in handy when you're at home, watching movies in your free time, it may at least make presentations a bit easier. Aside from the viewing angles, the biggest drawback here might be the screen resolution. We'll admit that 1,366 x 768 will be good enough for many consumers, especially if the price is low enough. But in this case, we're talking about an expensive machine, and these aren't mainstream consumers, but rather, the sorts of power users who really would've preferred 1,600 x 900, if not 1080p. Luckily, a 1,600 x 900 option is coming for US and European customers, but not until early March. As you'd expect, audio isn't this business machine's forte. The sound is tinny, as is the case on lots of laptops, but we also noticed the sound never gets very loud, even with the volume pushed all the way up. 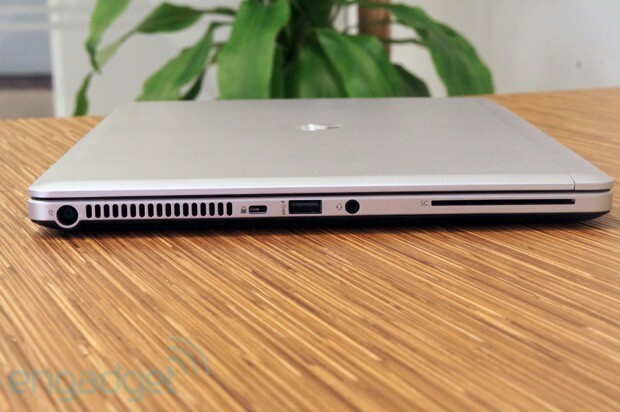 Our $1,349 configuration packs an Intel Core i5-3247U processor, 4GB of RAM and a 180GB SSD, also made by Intel. If raw numbers are any indication, it's just as fast as, if not faster than most Windows 8 systems we've tested. Its PCMark 7 score of 4,762 is slightly higher than what we've seen from other machines, while the solid-state drive is among the speediest (the Acer Aspire S7's RAID 0 setup notwithstanding). In particular, it notched peak read speeds of 553 MB/s and max writes of 519 MB/s, according to the benchmark ATTO. As it happens, we've seen a few other Windows 8 systems with similar read rates (the Dell XPS 12, Toshiba Satellite U925t and Acer Iconia W700, for example), but most can't compete when it comes to write performance. Speaking in more practical terms, the machine starts up in 11 seconds, which is just slightly faster than what we've seen in similarly configured systems. (Note: we're talking 11 seconds versus about 12, so the difference is actually negligible in practice.) In general, too, the machine was able to keep up as we jumped from app to app, and was quick to launch new programs. As for graphics performance, the Folio appears to be merely average: its scores fall right in line with other Ultrabooks using Intel's integrated HD 4000 graphics solution. Which is to say, you can get away playing an older, not-too-graphically-intense game so long as you refrain from maxing out the settings. Even then, you'll be lucky to hit 30 fps. Now this is more like it. Just when we were starting to wonder if Windows 8 machines were all cursed with short battery life, we started testing a couple winners. First there was the Acer Iconia W700, a laptop / tablet hybrid that lasts seven-plus hours. Now we have the EliteBook Folio, which managed six hours and 18 minutes in our battery rundown test (video looping, WiFi on, brightness fixed at 65 percent). If you look at the table above, you'll see that's among the best showings we've seen from an Ivy Bridge Ultrabook of any size. Granted, we fully expected the Folio would do better than a touchscreen machine, since touchscreens are known to take a terrible toll on battery life. Still, it fares considerably better than other non-touch Ultrabooks, including the ASUS Zenbook Prime UX51vz and the ThinkPad X1 Carbon. We mentioned earlier that much of what makes the Folio a business machine boils down to certain software features. Many of these are wrapped up in HP's ProtecTools suite, a collection of utilities that includes a password vault, facial recognition, pre-boot authentication and SpareKey, a protocol that helps you log into the computer even if you forget the password. In the case of facial recognition, it's actually a two-step process: once the PC registers your face, it then searches for your Bluetooth phone, which would have to already be paired. You'll have choices of operating systems, too. In addition to choosing Windows 8, you can downgrade Windows 7 -- you know, in case your business isn't quite ready for Lives Tiles and the Charms Bar. If you decide to go that route, you can actually choose between Windows 7 Pro and Home Premium, with both 32- and 64-bit options on the Pro side. The Folio is also SUSE Linux-certified, if that's what you're used to. In a perfect world, serious business machines would all come with zero crapware installed. As it is, though, you'll have to settle for "less crapware than on a consumer machine." Indeed, the load is fairly light here compared to a typical off-the-shelf PC, but there are still a few apps you might not have wanted. These include Evernote, CyberLink MediaSuite, CyberLink PhotoDirector, CyberLink PowerDVD, CyberLink PowerDirector and PDF Complete. Like other business PCs, the Folio comes with three years of coverage, as opposed to one year for most consumer systems. That includes pick-up or carry-in service, along with toll-free, 24/7 phone support. Businesses can also arrange for on-site repairs, but that would mean upgrading the warranty, as this amenity isn't included in the standard plan. HP sells a handful of pre-configured Folios on its site, ranging in price from $1,049 on up to $1,448. All but two of them have the Core i5 processor we mentioned; those that don't have a dual-core, 2GHz Core i7-3667U chip. Each configuration has 4GB of RAM, along with the same screen resolution and graphics. At the lower end, you'll get a 500GB 7,200RPM hard drive instead of that 180GB SSD. The $1,448 model -- the only model that's more expensive than the one we tested -- has all the same specs as our review unit, except it comes with a docking station. It's possible you'll buy the Folio not because you need a business-grade system, per se, but because you just want a solid Ultrabook. If that's the case, you've got plenty of options, obviously, though we've so far struggled to find a standout; many have been marred by short battery life and quirky design choices. It's possible you'll buy the Folio not because you need a business-grade system, but because you just want a solid Ultrabook. Still, if you're willing to take a chance on a non-touch machine like the Folio, then we don't mind steering you toward one of our old favorites, the Samsung Series 9. Sammy's now selling it with Windows 8 pre-installed, so it's hardly out of date. At the time of our testing, we were impressed by pretty much everything: the lightweight, impossibly thin design, the fast performance, the bright 1,600 x 900 screen and the long battery life (granted, we tested it with Win 7). Our only caveat would be that it doesn't have a touchscreen for interacting with Windows 8 but again, if you're seriously considering the Folio that's probably not a dealbreaker anyway. If you need the kinds of IT-friendly features offered on the Folio, though, something like the Series 9 probably isn't going to cut it. For those of you who won't consider anything other than a business machine, there's but a few options. We'd say the Folio's closest competitor might be none other than the $1,249 ThinkPad X1 Carbon (or the X1 Carbon Touch, if you do want a touchscreen after all). This, too, is a 14-inch business Ultrabook, with a 1,600 x 900 display, Ivy Bridge chipset and business features like TPM, BIOS encryption, a fingerprint reader and vPro processors for remote management. We're still waiting for a chance to test the touchscreen version, but we already know the X1 Carbon is one of the finer Ultrabooks we've tested, that high price and so-so battery life be damned. While you're at it, you may as well consider the Dell XPS 13 ($1,000 and up) and XPS 14 ($1,100-plus), which are sold on both Dell's consumer and small business sites. Similar to the Folio and X1 Carbon, these offer business-oriented features like TPM, asset tagging, corporate images and custom BIOS. Particularly with the 14-inch model, we were impressed by the battery life and mighty graphics performance, though both offer a sophisticated design, comfortable keyboard and much-improved trackpad. The way we feel about the EliteBook Folio 9470 reminds us of how we felt about the HP Folio 13, which we reviewed nearly a year ago. Both are buttoned-up sorts of systems: serious-looking, and with enough security features to satisfy the IT guys. And yet, conservative as they seem, they ended up being among the best Ultrabooks in their day -- so good, in fact, that we'd recommend them even to regular consumers. Compared to other Ultrabooks on the market right now, the 9470 offers longer battery life, a wider port selection, a smoother trackpad, a more comfortable keyboard and slightly faster performance. It's pricier than similarly specced models but then again, it comes with a three-year warranty, which is nice to fall back on. Still, it's not perfect: it's thicker and heavier than competing models, it currently has a lower-res display and there's no touchscreen for interacting with Windows 8 (if that's what you're into). Folks who want those things should check out Lenovo's ThinkPad X1 Carbon Touch, though we can't promise the battery life will be as good, as we haven't had a chance to test it yet. That said, if you're fine with 1,366 x 768 and don't see much appeal in being able to touch the display, the EliteBook Folio is a solid performer. Update: An HP spokesperson has confirmed to us that the Folio 9470 will get a 1,600 x 900 resolution option in early March. That option will be available to customers in the US and Europe.